Well, it looks like Dad’s welding mishaps were too difficult to fix after all. Since we didn’t want to inflict any more damage than had been done already, or delay our project any longer, we decided to leave it to the professional. Dan, who runs the muffler shop across the street from TLG, was kind enough to finish the job for us. He quickly patched up the blowout holes, and now all I have to do is grind down the excess metal. Next step: rear quarter panel replacement. These will probably be spot welded in place once the old ones are cut out. Dan told my dad that the 1969 Boss 302 had fake side scoops like ours, but I’ll have to run a fact check on that—I’m pretty sure I remember the Boss looking a bit more sleek. First post of the new year! This year I resolve to finish restoring the Mustang by my high school graduation on May 31, and if I put the pedal to the metal I might just do it. Now that we’d moved to a smaller guage wire (from .030 to .024), Dad discovered that it was possible to lay a continuous bead along the sheet metal. Dad’s zealous trigger finger, combined with the fact that grinding made the metal thinner and that one of us had accidentally bumped the wire-feed dial from 30 to 40, led to numerous blowouts. 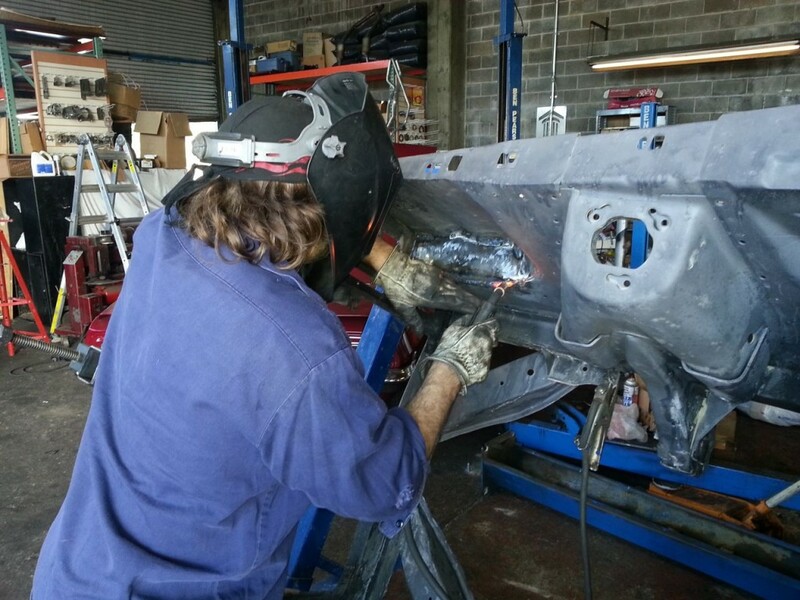 By the time I had stopped him from wreaking havoc on my car, Dad had managed to place a few sizable holes in the place of what had just been smooth, clean welds. It was time to leave before we got a chance to perform any repair work, so at least I have a plan for my next jaunt at TLG. Expect a much more frequent posting schedule in the upcoming months. I plan to visit during the week whenever possible, and every weekend. You are currently browsing the Three Lions Garage archives for January, 2013. 48 mySQL queries in 0.172 seconds.